Can you do Life Planning on the web as well as an in-person interview? What are the essential elements of a web based Life Planning Service? What is essential for the intimate, personal process of Life Planning to be delivered and how could it be approached through a computerised process? Receive a free e-book for attending: "Life Planning for you", the companion book to the LifePlanningForYou.com website. -To what degree can you computerise the Life Planning process within your own firm and is it advisable? -What are the advantages of having it on the web? Participate in a global visioning exercise. 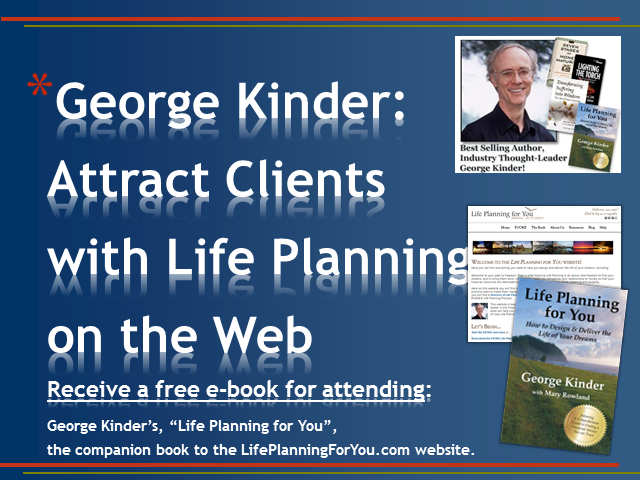 George Kinder, internationally-recognized thought leader and father of the financial Life Planning movement, invites you to Life Plan civilization! This BrightTALK is one of hundreds of conversations happening globally since the launch of Kinder’s latest book, A Golden Civilization and the Map of Mindfulness (available for pre-order on Amazon now and for purchase March 4, 2019). The grassroots movement of community conversations asks attendees to vision a Golden Civilization and then work to establish it now. Be part of the movement that is changing the world one conversation at a time. With George Kinder as the conversation facilitator, you’ll practice inner listening, hear the perspectives of others worldwide, share your own perspective, and together you’ll create a vision statement that captures the kind of future you want for yourselves and your grandchildren. With a clear and energizing vision of a Golden Civilization, Kinder will challenge you and each member of the group to think of how you can live into this vision now. Offering no judgement to the steps participants choose, Kinder values each contribution and demonstrates the art of empathic listening. At the end of the conversation, participants are invited to host their own conversations with friends, family, or any group they represent. More resources are available at www.agoldencivilization.com. Step boldly into your greatness by accessing the present moment. Thought leader, mindfulness teacher/author, and finance guru George Kinder unveils his life’s work with a Map of Mindfulness. He uses the map to explain new forms of leadership, economics, and democracy all rooted in the present moment. This radical 60-minute talk offers insight into how you can personally apply his methods to access your inner leader and enhance your performance in every aspect of life: at work, with your family, and in your relationships. Kinder explores how strong leadership skills come from being present. Always residing in the present moment means you are ready for anything from inspired action to empathic wisdom. His leadership system democratizes entrepreneurial spirit, maximizing both innovation and growth across society as it maximizes the efficient allocation of human capital. He shifts the frame of economic thinking by grounding all of space and time in the present moment and argues that moments of freedom rather than moments of transaction become our focus. He proposes self-knowledge as a more sustainable motivator than self-interest. In just one hour, you will understand the present, how to access it, and how it enhances your leadership potential. You’ll discover how to live in the moment and inspire others. You’ll gain a new way of visioning what is possible for the organizations and communities you represent and the tools to take steps to enact change now. Kinder’s work aims to impact civilization. He’s recently launched a grassroots movement of community conversations happening globally that asks attendees to vision a Golden Civilization and then work to establish it now. His latest book, A Golden Civilization and the Map of Mindfulness, is available for pre-order on Amazon now and can be purchased March 4, 2019. To celebrate the book’s launch, we offer attendees of the live BrightTALK on March 4 a special one-day price of $2.99 for the Kindle version. It's time to Life Plan civilization! Kinder Institute founder, George Kinder, leads a live training focused on hosting community conversations for a Golden Civilization. Inspired by his latest book, A Golden Civilization and the Map of Mindfulness, George encourages you to step into leadership roles within your communities and help groups vision the future and live into it now! The webinar includes steps for leading successful conversations and a Q&A. Spend an hour with George Kinder as he leads a group meditation and discusses how to continue developing a mindfulness practice for yourself. There will be time for Q&A and discussion. - You will:Learn the daily practice of Mindfulness and how it delivers practical benefits. - Have access to an audio guide to a daily Mindfulness practice. - Receive a free on-line copy of George Kinder’s book, Transforming Suffering into Wisdom: Mindfulness and The Art of Inner Listening. Spend an hour with George Kinder as he leads a group meditation and discusses how to develop a mindfulness practice for yourself. There will be time for Q&A and discussion. Spend an hour with George Kinder as he leads a group meditation and discusses how to establish a mindfulness practice for yourself. There will be time for Q&A and discussion. How to design & deliver a work-life balance that maximizes our best efficiencies at work and our most meaningful life outside work? George Kinder has specialized in delivering work-life balance to consumers and professionals worldwide through Life Planning and Mindfulness trainings and workshops for 30 years. The world today requires commitments in more areas than ever before. The requirements for work have been continuously expanded with new daily technologies, constantly competing with family time and lifestyle choices. Balancing a healthy lifestyle is critical for the future success of everyone in the workforce today. Combining thoughtful financial Life Planning with Mindfulness delivers work-life balance to everyone. Mindfulness gives you the ability to recognize where you sacrifice your work-life balance. Life Planning defines the balance you really want and the financial elements needed to secure it. Join this webinar and learn how to design the best of lives for yourself, your employees or your clients that simultaneously maximizes efficiencies at work. 4.Have access to an audio guide to a daily Mindfulness practice. Anyone seeking to improve their personal work-life balance or to help their clients or employees improve their work-life balance. Great communication starts with great listening. And great listening starts with an inner listening called Mindfulness, a simple practice done 10-20 min. a day that makes an average communicator into a great one. Transform hollow interactions into engaged, dynamic relationships by being present and in the moment. Learn why successful organizations all over the world are bringing Mindfulness to the workplace. Developing inner awareness leads to productive relationship building, sharpening crucial skills in management, improving sales & operations at successful firms. Win the trust across the spectrum of those you communicate with, from clients to colleagues, employees to senior management, in every interaction. 1.What Mindfulness is & why it is useful in the business world. 2.How this simple practice enhances self-awareness, making one a potent & attentive listener. 3.How to be 100% in the present moment, focused, free of distractions. 4.A 5-phase process that leads to effective communication & deep trust, yielding sustainable professional & personal relationships. •Learn the daily practice of Mindfulness & how it delivers practical benefits. •Have access to an audio guide to a daily Mindfulness practice. •Receive a free on-line copy of George Kinder’s book, Transforming Suffering into Wisdom: Mindfulness & The Art of Inner Listening. Anyone who wishes to be more effective in their communication skills, with greater control, clearer focus, more patience, flexibility & skill, greater leadership & access to intuition, values, creativity, & managing stress & difficult emotions with poise. Life Planning or Buyer Beware: In the aftermath of the banking crisis, consumer trust in financial services is at a dismal low, as amply illustrated by the latest Edelman survey. Rebuilding client relationships in today’s environment requires a new approach. George Kinder, father of the Life Planning Movement, has developed a holistic approach to engaging the client that reframes the client’s relationship to money within the context of his or her whole life. For the advisor, this pays off in what’s called the “client relationship dividend”. The interview process can be accomplished in as little as an hour or, for sophisticated clients with more complex needs, in a series of longer meetings. The method has been shown to deliver dramatic positive results consistently. Inspirational session on the profitability of using the client-centered, highly-structured interview process known as Life Planning. To the client, it is an exciting, moving and exhilarating process often described as 'the conversation of a lifetime', leading them to pursue their lives with greatest meaning and value. But to the advisor and their firm, this is a highly structured interview process with measurable deliverables at the end of each phase that can be embedded in software, trained, scaled and sold. The father of Life Planning, George Kinder will describe the value of integrating an empathy and inspiration advice model throughout the firm. He will share from his experience of working with a variety of different size firms in Europe as well as North America. His model of the EVOKE(R) Client Interview Process is a valuable framework for professionals that embeds trust into the client advisor relationship while increasing profitability for the firm.